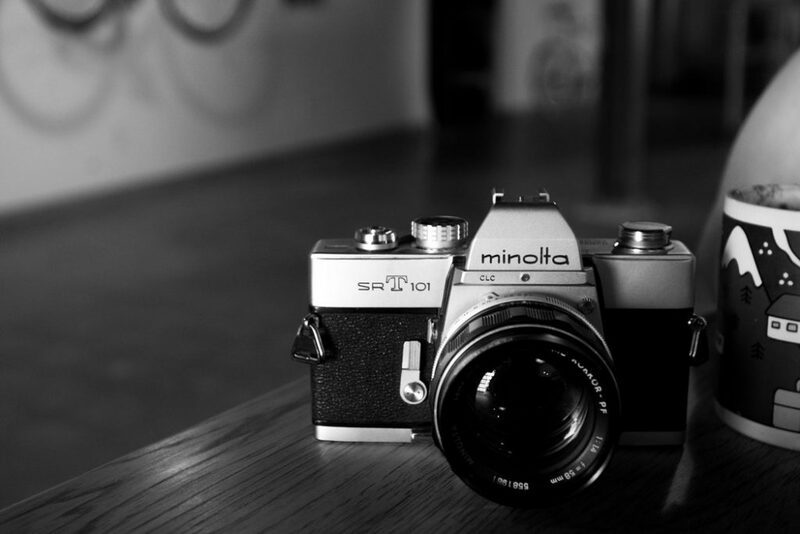 Minolta X-370 Film Camera With A Standard 50mm f/1.7 Lens[/easyazon_link]If you have cultivated the practice of photography, then fiddling with Minolta X-370 will likely present you with a good experience. This film camera: Minolta X-370 Film Camera With A Standard 50mm f/1.7 Lens has a knack for manual mode shooting with a viewfinder that displays your selected shutter speed alongside the recommended option. This camera has great interchangeable lens options. For the standard 50mm 1.7F lens can shoot some sharp images. You can get a wide angle lens, one tele lens, a macro attachment, and our personal favorite, 75-300mm zoom lens. Just make sure you have nice lens caps to keep them clean and safe. Some camera buffs have a preference for the older models like the XK or SR-T, but if your intent is to utilize the quick-fixes that the X-370 provides then you are on good grounds. Compared with the X-700 Minolta X-700 Film Camera And A 50mm f/1.7 Manual Focus Lens , it might not measure up, but its shooting edge is unrivaled. While modern-day Minoltas have the automation slant, the range of the X-370 has its inbuilt microchips which of course showed that their inventors considered the eventual advent of digital photography. I have learned to switch to exposure compensation and aperture manipulation whenever I leave my X-370 behind in order to use the X-700 that hangs in my locker. Having an option to my X-370 allows me to fiddle with other shooting modes when I am not thinking of the manual mode operation it operates on. This can be a plus! The Minolta X-370 camera comes with a shutter speed that can be varied and this can go from as snappy as 4 seconds to a fraction of a second. Your exposure limit you desire for your film will determine the speed you choose to set it at. The single lens reflex tweak gives the X370 an edge, which allows you to see a picture preview before you proceed to snap it. The 35mm film standard is what is installed on this camera and this is easy to develop and readily available at the stores. The MC Lens mount that makes this camera stand out is an attraction while not forgetting that it is MD mounts compatible as well. This will enable you to use the lens size you desire for your image capturing. So, whether you are ready to work with smaller lenses or even the bigger ones, you will not need to go in search of mounts, as this comes with the X-370. The inbuilt self-timer makes it possible to click images in automation within 10 seconds even if there is no photographer at hand. The X-370 has a similar gadget in the PhoenixP-5000 and I can attest that except for the cladding on the body, which comes as a removable feature, the latter is a closer look. As an SLR of 35mm configuration, the focusing scenes come across as a feature that photographers find pleasant and useful as they pinpoint their lens focus and make out the outline of their shots. This X-370 comes primed with a kit that offers 50mm as a grab you cannot ignore. Though the original model came with a 35mm, the add-ons provide you more options to explore when you are about to capture those moments you will treasure endlessly. You have the equipment to capture clear images with a crisp outlook that makes it pale into irrelevance if they are still or on the move. It comes with MD Rokkor lens-compatibility. You have the benefit of an electronic shutter. A strap and batteries as accessories. The sound and look of the camera are alluring while the feel is magnetic. The ease of replacing batteries and film roll makes it a gadget of choice. I found the manual easy to read and comprehend, as I first read through to appreciate the film camera better. The packaging that came with the Minolta X-370 was added to the excellent delivery condition. Few grumps about the battery –life. Considered to be gender-unfriendly because of its heavier weight and for ladies who prefer the athletic and easy-to-move-with brands of film cameras, this might not be your best bet. Having acquired a couple of cameras like the X-570, X-700, and the Canon EF, I can confidently say that the X-370 has pride of place in my camera collection rack. The SLR feature is a huge selling point which many cannot ignore. Many users refer to the longevity and I concur in saying that having a gadget that lasts beyond a few seasons can be an emotional cling or passion as the years go by. Getting used to seeing your favorite camera around you for that long makes it a part of your life if you are really a photography aficionado. The Minolta X-370 SLR, along with the Pentax K1000, may be one of the best beginners’ cameras of all time. It is robust, reliable and has a huge selection of lenses and attachments. Its simple exposure meter and priority aperture control are suitable for novices and experts alike. I have been tracking them down in fleamarkets and hock shops for twenty years to give to my children, nieces, nephews and anyone I care about who expresses an interest in film photography. Thanks Matt. I like Minolta X series because they are sturdy (reliable) and easy to use. If you can point & shoot with any film camera, Minolta X-370 is going to feel very natural for you.